I arrived by train and stepped out of the station to see Windsor Castle on my left and the luxury barge hotel Magna Carta on my right. I boarded this traditional barge and was immediately given a warm welcome; by both the comfortable country-house-hotel style atmosphere of the Magna Carta, and Kat, the resident hostess, who is there alongside the other hosts, including the Chef and Captain Dominic. The main lounge area has four very comfortable leather sofas, well stocked bar, and a well stocked library of both reference and fiction books, as well as games, DVD's and CD's. There was a real wood dining table that seats all eight passengers. The Magna Carta was built in 1936 and is over 16 ft wide, has four cabins all decorated with fine mahogany, oak and teak wood furnishing, colour televisions and DVD player, hair dryer, very comfortable bed, ample hanging space and storage, full length mirror and a well lit mirror in the bathroom ideal for putting on make-up. I was shown how to control the air conditioning and under floor heating in the main cabin and the large en suite bathroom. The cabin was very bright with four windows overlooking the river, when I looked out there was a swan looking in at me! All cabins in the fleet are designed either like the Magna Carta with a country-house-hotel atmosphere or a more modern contemporary feel. They do not all have televisions, however if you choose to charter the whole boat a television can be requested. All boats are refurbished every ten years. I was then taken back to the upper deck and served afternoon tea. We were all introduced to Captain Dominic and Kayleigh, the resident guide, and we were advised that it was an open bar where we could either ask to be served or just help ourselves. Outside on deck there is a comfortable spacious seating area with large, comfortable chairs, tables and parasols; there is even a heated hot tub! I slept very well the first night in a comfortable bed and woke to see the Thames with swans, geese and ducks searching for their breakfast. I went searching for mine and found the other guests seated around the dining table, there was a very varied choice of cereals, fresh coffee and fresh orange juice. Our chef came out and introduced himself and ran through the full cooked breakfast choices, Kat took our orders and when it arrived it was beautifully presented and very tasty. After breakfast we decided to explore some of Windsor, we could not have been nearer to the sights, the flag was flying so I guess HRH the Queen was in residence, if she had looked out of one of her windows I expect she would have been as impressed with the magnificent sight of the Magna Carta as I was with her castle. Back on board for lunch and again chef came out and ran through all the exciting tastes he had put together, it tasted even better than it sounded - I could have been dining at a top 5* restaurant. Magna Carta sails along the Thames, her season starts in spring through to autumn from Hampton Court to Henley on 6 or 7 night voyages. There are 19 boats in the fleet of European Waterways, that cater from 6 to 20 guests. All luxury barge hotels have their own identity and are not all the same. A lovely feature is always dinner, which is served with good quality wine, however fine vintages cost extra, but champagne is free. Chefs prepare fresh cuisine, and will come out and explain what the meal is. Tour guides are very knowledgeable. Breakfast is informal. Tours and excursions are in the morning, they include vineyards, Chateau's and local castles. All luxury barge hotels have their own mini bus, so guests can request to visit somewhere not included on excursions, i.e. antique shops etc. Lunch lighter than dinner and can be al fresco on deck. You spend the afternoon cruising along the river. Dinner is so good that chefs quite often get standing ovations. You never sail at night, so there is always the opportunity to explore the local area in the evening. 90% of the routes that European Waterways sail are on canals. During a six or seven day cruise you will cover approximately 60 to 70 miles. You get an intimate glimpse of the area you are in; going through 20 to 40 locks in a week. When the barge goes through locks you can walk alongside, or explore the canal on bike. All luxury barges carry bikes, and the guide will tell you how long you have if you would like to cycle into local towns. Most barges in Burgundy sail on canals built through vineyards. The BBC filmed celebrity chef Rick Stein on board their hotel barge Anjodi, cruising through the vineyards of France, and made it into a successful series called "Rick Steins French Odyssey" which is often repeated on the Food channels on SKY. All guests are sent a ship's log when they book, with information on all boats in the fleet, along with a history of barges from the 1800s and information about the waterways and locks. Lifts are an option to standard locks, and there are three types: vertical, wet and dry. The ships log has information about all the waterways in Europe and the sights to be seen while on them. A feature of the itineraries is wine and cheese so there is also a section about the various wines and cheeses to be found along the various waterways in the UK, Ireland and Europe along with a brief summary of regional cuisines. Finally space to keep a log of your journey, contact details of the new friends you have made and pockets at the back for photographs. Their latest vessel is the stylish La Bella Vita with the "Classic Italy Cruise" and from April 2011, this will be the largest hotel barge in their fleet, carrying 20 passengers. Starting in Venice, the boat sails across the lagoon to Pellestrina, then on to Chioggia and The River Po delta, passing through a nature reserve. Dinner on one evening is hosted by the owners of a private stately home where Lord Byron wrote some of his best poetry. The next morning you will join Canal Bianco ending in Mantua. 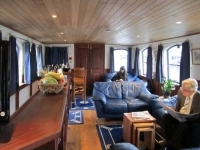 The Bella Vita has 9 standard size cabins and 2 larger upper deck cabins with Renaissance architecture.